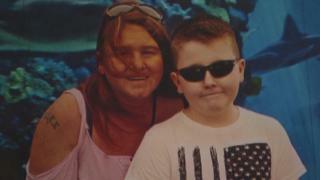 A housing association has apologised after issuing an eviction notice that would have forced an 11-year-old boy out of his home after his mother died. The boy's father Andy Hollingworth wanted to take over the tenancy of the house in Oldham that was under his former partner Maria Jones's name so he could look after their son Alex. He said it was not feasible for Alex to live with him at his parents' house. First Choice Homes had refused and told them to leave by 18 March. Mr Hollingworth had told them there was not enough room at his house and he wanted to look after his son who has been in remission from cancer for two years. Alex had lived alone with his mother but she died following a heart attack last week. Mr Hollingworth said: "Alex would be devastated if he had to leave. "It's bad enough losing his mum at 11, but losing the house as well, that's another thing. "All his friends are here, he's got memories of his mum here, it's where he's grown up since he was a baby. "His school's across the road, family's round here, people who can support him." On Monday, the housing association, First Choice Homes, withdrew the order and offered "an unreserved apology". A spokesman said the notice to quit the property was issued in error. He added: "We are currently working with Mr Hollingworth on a number of options that will ensure Alex can remain in his home. "We will be carrying out a review of our process to ensure that a situation like this does not happen again. "Our thoughts and condolences are with Maria's family at this time and we will do all we can to support them."